Now this game was definitely annoying with all of its battles and quirky leveling system. One could use the exploit and make your characters godlike, but, that takes time. Who as the time to do that anyway? We all have lives don’t we! This mod makes it so you start off godlike so you can breeze through the game and enjoy the storyline and gameplay! 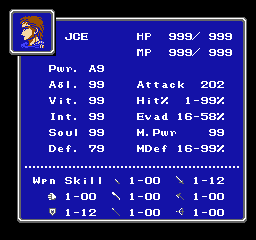 Adjusted the character stats to 999 HP/MP and 99 for the rest. 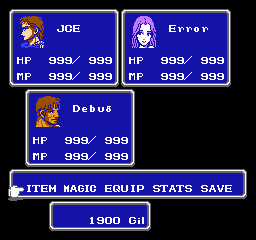 Gave all major characters some really good starting equipment. 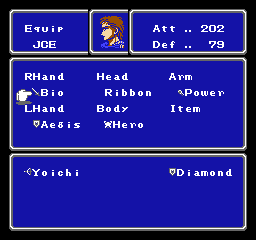 Edited 1 weapon (Bio Sword) and 1 armor (Hero Armor) to give godlike stats. 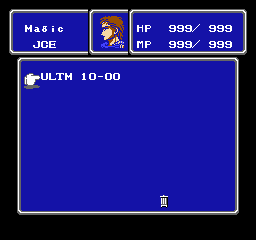 Gave the starting characters the Ultima spell to defeat the 4 Dark Knights. Tip: You will have to kill the Dark Knights in the first battle on a new game. You can either have the characters use Ultima or just attack. Either way will work eventually. And as a bonus you will get exp for the method(s) you use to kill them! 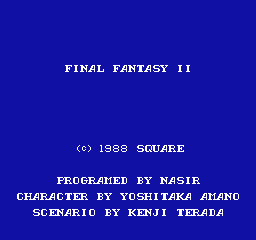 NOTE: This patch will work on any version of the Final Fantasy II Famicom/NES ROM file. You can even patch this over a translated ROM if you wish.